Since our blog audience is growing I feel more obligated to get a post up every two weeks at a minimum. So here you are. The rain came and wiped out 2.5- 3 days of work, so progress has been slowed. This is generally a drier time of year, but not so the past two weeks. We only had one small concrete pour which was a support wall for the deck. I continue to get requests from my builder like “we need aluminum drip-edge for the roof this morning”, I then get it, and it sits at the site for two weeks without being touched. The drip-edge is still not up. This has happened with several items. Domus Windows from Antigua met with us last week. We are leaning towards buying our PVC windows and doors from them. Their pricing beats PVC Windoors out of Miami by a substantial margin. We need to make a decision within the next few days. We have somewhere around 40 windows and french doors so this is a substantial part of our budget. I continue to work with Caribbean Building Supply out of Miami to get materials to St. Croix. Last week we had a slight goof-up in which my materials didn’t make it onto the CaribTrans boat. Both companies blamed each other but with the rain we had the week delay in shipping shouldn’t delay construction. 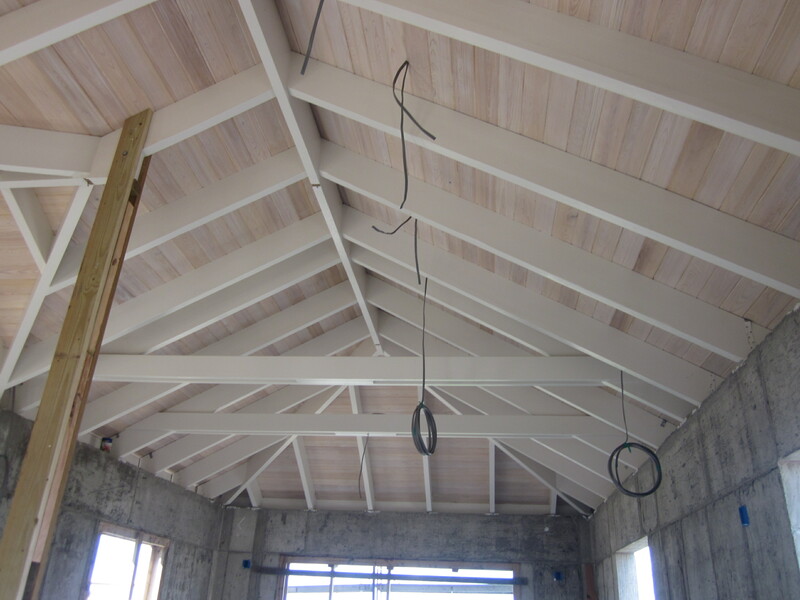 The rafters were completed for the office and guest bedroom roofs last week. Painting was finished on them today. Over the past two weekends we sanded and stained another 110 cypress boards which will start going up tomorrow. The the most visible work that has gone on over the past two weeks is the framing ofthe deck and getting the rebar in. They are also working on the deck steps, pool steps, and steps to the electrical room below the master bath. We are scheduled to pour these items on Friday. Fingers crossed. I am posting the photos in a slightly different manner. When you click on a photo there will be arrows at the bottom to move to the next or previous photo. This entry was posted in Building A House and tagged Caribbean, construction, Domus, PVC Windows, St. Croix, USVI, Virgin Islands by admin1. Bookmark the permalink. I was going to ask you, “Why all the cypress?” but with these pix I understand. Just beautiful! The architect put the cypress in our drawings. We were a little indifferent at first, but went and looked at a few houses that have the “pickled” cypress and were sold. So we are pretty sure we are going to do it throughout the whole house, but it is quite a bit of work. It is also fairly expensive. We have been buying the “select” grade which is about $5 more per board than the grade below it. There is apparently a grade above this as well. We are getting better with the finishing part of it as we go, so the rest of the house should look a bit better than the master side.